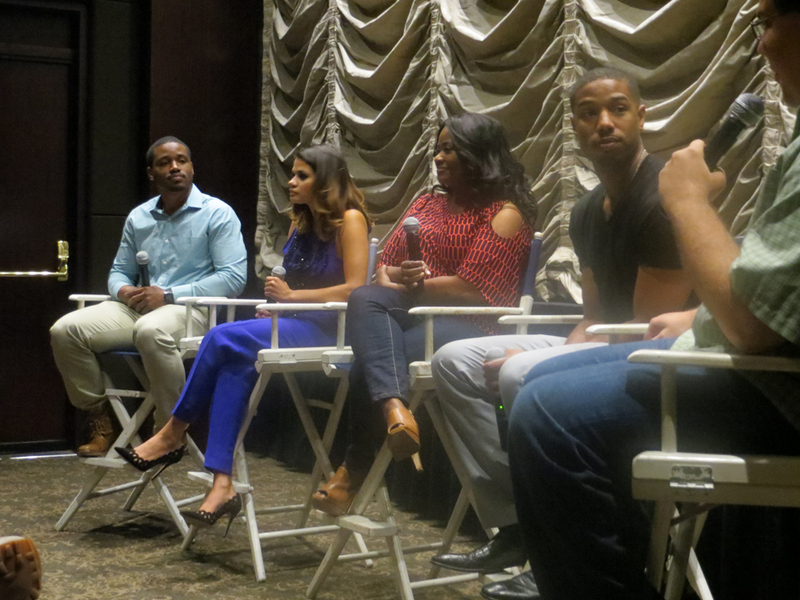 The following questions and answers are excerpted from a conversation that followed the NBR screening of Fruitvale Station. Jordan: It was very intense. Like Melonie said, there was definitely a presence there. I got to embrace it, and I used to pray to Oscar all the time. Knowing it happened right there was almost like laying in a chalk outline. It was very heavy, having the train there, the police, and the passengers all reenacting that moment. Every take we did it was like losing my life again. It sits with you for a while. After that day, I took one of the longest showers I’ve ever taken. It sat with me for a while. 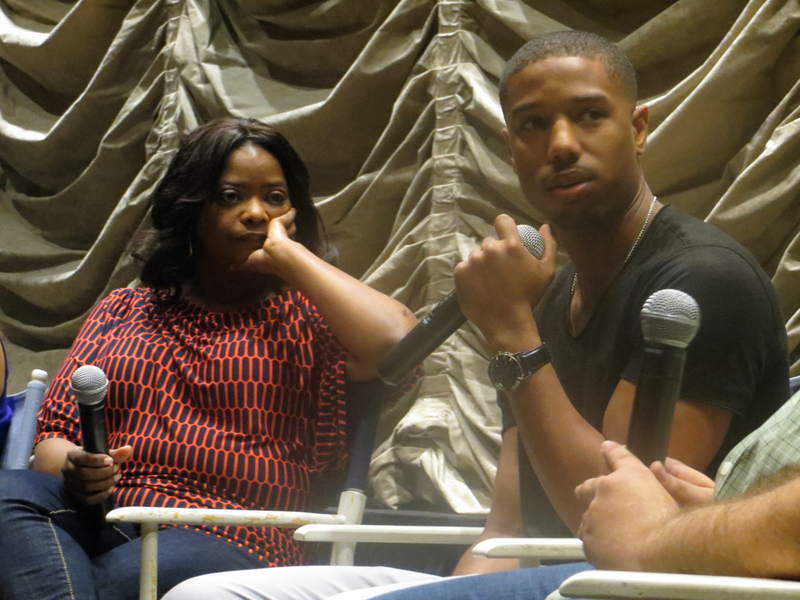 Coogler: We only had four-hour segments to shoot over three days, since BART can’t shut down. So we shot from 1AM to 5AM in the morning. Bart employees were there, Bart police were there, cast, crew, extras. And before we shot, everyone would join in a circle and have a moment of silence. At that moment it felt like we had a shot. That’s what it was all about for me – bringing a community together over the film. And I had proof that aspect was already being accomplished. The actors gave it their everything, the crew gave it their everything, it was like we all had something extra to fight for. Octavia, tell us about your decision to come on board. I read somewhere that they asked you right after you won your Oscar, and didn’t expect you to say yes. Spencer: I almost missed out on the opportunity of lifetime to play Wanda. It did come after the Oscars. I had two days off before going to Europe to work for four months. I was here in New York for those two days and my agent wanted me to do a little homework. He sent me a lot of material that I didn’t have the time to process, so I watched Ryan’s short and some of the phone footage of the actual incident, and I was really affected, incensed actually. I was very angry and felt a little disenfranchised, and I didn’t want to do this project because I thought anger was not the right emotion, especially with everything going on with the Trayvon Martin incident just occurring. I told my agent I couldn’t do it because all I would bring to it was anger. And my agent said, “well, I’m glad you feel that way, but you need to read the script” (laughter), so I read it and I thought Ryan Coogler was a young Jewish guy! Turns out he’s not. And it made me realize that even in my mind I wasn’t as open-minded as I thought. Ryan’s perspective wasn’t what I thought it would be. I thought it would come from a place of anger, but instead it was refreshing and after I read it I was so glad I didn’t pass on it for real. Ryan, what went into the decision to shoot on 16mm film considering that can be such a big financial commitment? Coogler: Well first I have to say that we had so much support from non-profit organizations. 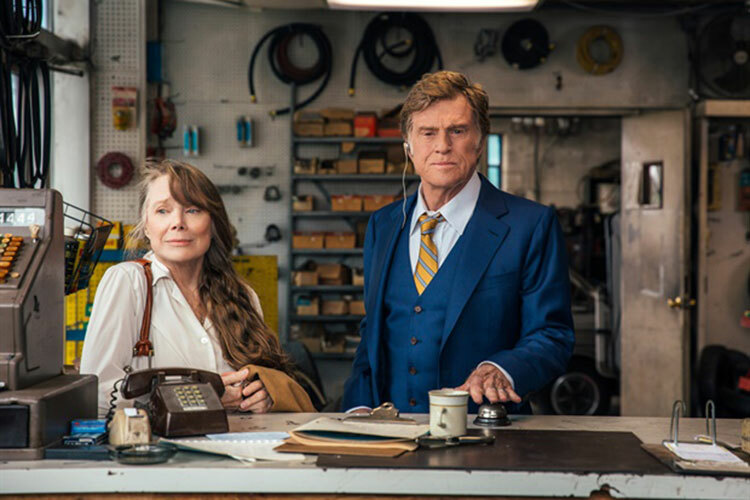 The Sundance Institute Feature Film Program made an introduction between us and Kodak and ARRI CSC, and the San Francisco Film Society gave us both a production grant and a post-production grant. That being said, the creative decision that went into it is that I’ve always liked Super 16 because it has a very visceral quality. We associate that grainy structure with the tangibility that comes from documentaries. I wanted us to feel like we were right there with those characters. I also wanted to shoot it on celluloid because I think it has an organic quality. Oscar was killed on digital, a cheap digital medium, and that’s how people saw him in those videos, they couldn’t even make out his face. I thought it would be good to bring this story back to life in a more organic fashion. I also like the 1:85 aspect ratio. For me this is a domestic drama, not an action film. I think it’s great for shooting homes and real interiors.